Have the plugin Open Badge Displayer installed (available since 8 August 2013). Use an iframe. This method is not recommended any longer as there is no verification of the email address and you could essentially display someone else’s badges. This tip was first published in the blog post “Open Badges in Mahara: The quick way” by Kristina D.C. Hoeppner. You will need to create a Persona account in order to use the Mozilla Backpack. Increasingly, you can connect with Persona to websites. You can also use it as authentication method in Mahara. Follow this section if you have the Open Badge Displayer plugin installed. 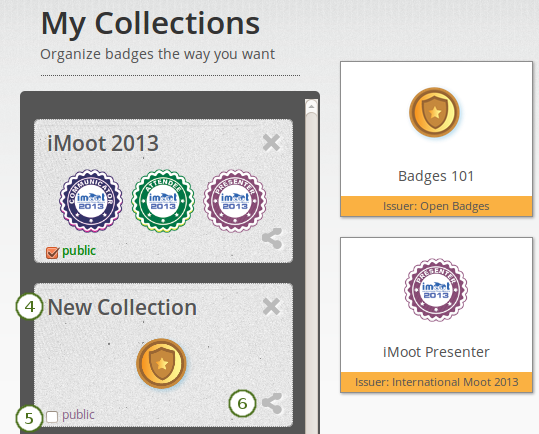 Create a page in your portfolio or edit an existing portfolio page where you want to display your badge collection. 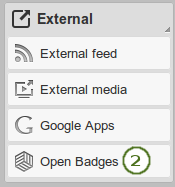 Drag the Open Badges block onto your page. This block is only available when you have the plugin installed. Select the badge collection that you want to display. If you do not have the “Open Badge Displayer” plugin installed, you can follow these next steps. Copy the URL of your public collection. Create an iframe around it so you can embed it into a Mahara page. You can use the Online iFrame generator for example to create your iFrame easily. Or you can copy this iframe code and replace the URL with your own. Copy the entire iframe code. Create a page in your portfolio and set the layout to 1 column. For the next steps to work, your site administrator must have added backpack.openbadges.org/share to the list of allowed iFrame sources. If this URL changes, your site administrator will have to correct it so your badges can still be displayed. 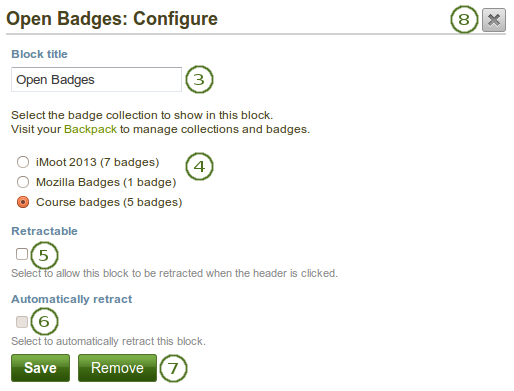 Once other badges backpacks become available, each will need to be added as allowed iframe if you store badges there. Drag the External content block onto your page. Paste your iframe into the URL or embed code field. Give your block a title. Save your changes. 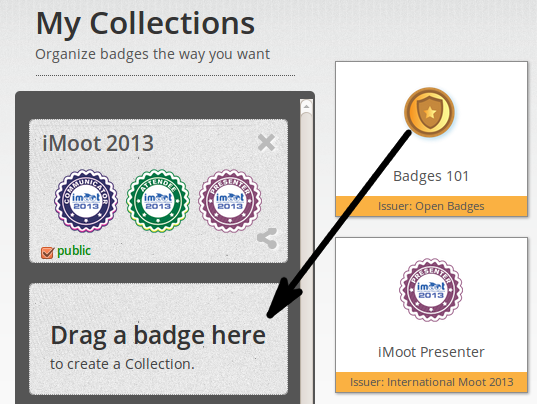 Your badge collection is now embedded in your page.